Memorable Ceremony is the full-service design, development and delivery of a customized Ceremony for your treasured and beautiful event: whether it is your Wedding, a Commitment Ceremony or Wedding Anniversary/Vows Renewal. 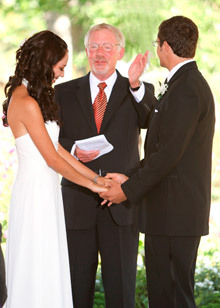 Memorable Ceremony includes a unique Wedding Ceremony Workbook, meetings, phone consultations, correspondence and time management with you, planners/coordinators, and others, as required. It includes Ceremony drafts for feedback and edit. And professional delivery of your Ceremony. If desired, your pre or post wedding activities could also include Relationship Coaching, by a Certified Relationship Coach. I am also available to conduct and manage a rehearsal of your event. Both of these elements are optional and are available at an additional cost. There are numerous couples that choose Colorado as the location for their destination wedding. I am pleased to work with brides and grooms from all over the US (and world!) to create their ideal Wedding Ceremony experience at altitude. It could be a highly choreographed and rehearsed event or short and very sweet. I am also delighted to provide assistance with locating appropriate venues and arranging for flowers, photography and music. If you have elected to have a friend or family member perform your wedding ceremony in Colorado, I also offer a Ceremony Consulting Service. With this service I do all that is offered in the Memorable Ceremony above, but Ceremony delivery is done by another person and your Wedding License is signed and officiated by me. Included are the personal service and detail that you would expect in a Memorable Ceremony, but at a reduced rate. "We are grateful that you were our Wedding Officiant. You helped make our day very special. We really appreciated your experience and professionalism. " "Girard, thank you for being our Wedding Officiant! The wedding turned out beautifully. Everyone was impressed." The Bride comes from the heart of dawn, and the Bridegroom from the sunset. There is a wedding in the Valley. A day too vast for recording.